I get all ready to lay down, and while I get myself some water, look who steals my spot. It’s not like he was willing to share, either. Evil. As per usual. Today I’m going out to look at the cherry blossoms in Brooklyn with a friend, except I think they might have fallen by now. Maybe I’ll suggest going to the garden at the top of Central Park and then walking back downtown through the park. Except it’s chilly right now. Either way. I feel like lipstick shopping though. Maybe I can talk her into that. In other news: Getting all excited about all the commercials for my favorite reality TV show, So You Think You Can Dance. Warning, I plan to start a campaign to get everyone to watch it. If you are going lipstick shopping try Loreal Infallible lipstick – I love it and it lasts for hours instead of just for 1/2 hour. Give it a whirl and see if you like it – You can get in regular Drug store instead of a Dept. Store. I like #200 and #100. May I ask the title of the new book? 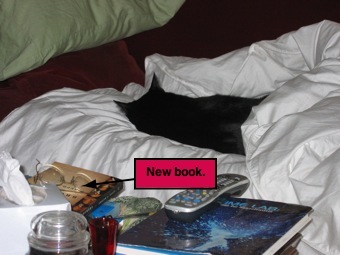 I assume Finney was reading it, before he fell asleep! Thanks for the lipstick tip — will give it a try! And the book is Founding Brothers (mostly about Adams, Jefferson, Washington and Hamilton it looks like). But I might be putting that off for a bit. I just bought four SF books to read on a possible quick trip to Boston. It’s not just a cat thing. My bulldog, Kirby, does the exact same thing the second I leave the bed and is like a bag of bricks to get her to move over. Can’t give you any lipstick advice, I’m glad to say.